Students and university websites—consumers of corporate brands or novices in the academic community? The research within this paper compares the positioning of students and corporate branding features on higher education institution websites within the higher education systems of Denmark, England, Germany, Ireland, Spain and Poland. The selection of countries reflects among other things different governance regimes. The paper first outlines the analytical framework used for content analysis of the extent to which evidence of the marketization of higher education is present on higher education institutions’ websites—especially with regard to the positioning and construction of student applicants. Secondly, it uses MANOVA to explain the variance by country and institutional type in relation to the presence (or absence) of different website features. Analysis of higher education institutions’ websites confirms the initial expectations about the link between market-driven higher education governance structures and constructions of students as customers. Nevertheless, the variance in these overall trends is high. Despite the presence of corporate-style features on the higher education institution websites and the linked understanding of students as customers, the between-country and within-country differences reveal also sometimes even more dominant alternative understandings of students and student applicants. In the systems with more academic self-governance or with a state-centred mode of governance (usually mixed together like in Germany, Spain or the state sector in Poland), students are seen either as novices in the academic community or recipients of public service. 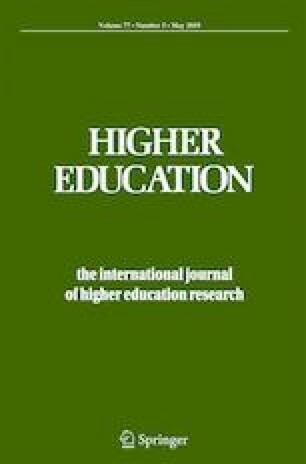 The empirical findings presented in this article suggest that there is considerable diversity in the portrayal of student applicants on higher education institution websites in Europe, rather than a common construction as only consumers. The online version of this article ( https://doi.org/10.1007/s10734-018-0315-5) contains supplementary material, which is available to authorized users. This project received funding from the European Research Council under the European Union’s Horizon 2020 research and innovation programme (through a Consolidator Grant awarded to Rachel Brooks, grant number 681018—EUROSTUDENTS). Saichaie, K. (2011). Representation on college and university websites: an approach using critical discourse analysis. University of Iova, Theses and Dissertations, May. https://ir.uiowa.edu/etd/1071. Accessed 24 Sept 2018.